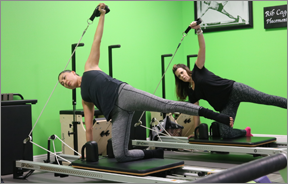 Required for all new members, this 45 minute Intro to Reformer will teach you the Stott Pilates Reformer machine basics and get you super excited for your first Reformer class! Please contact the studio at 951-279-8510 for more information. Intro classes are always free but must be reserved in advance by calling the studio or emailing us. If you have any physical limitations to exercise please contact us prior to registering for class. 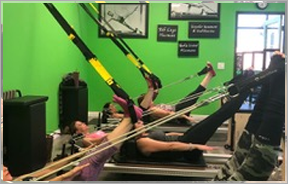 The most popular and versatile piece of Pilates equipment, the reformer facilitates hundreds of exercises that incorporate the total body leaving you feeling balanced and walking away with improved posture, strength and cardiovascular endurance. Every class is layered to challenge the beginner to the advanced practitioner. Toe Socks with grip are REQUIRED for all reformer classes and can be purchased at the studio or on-line. 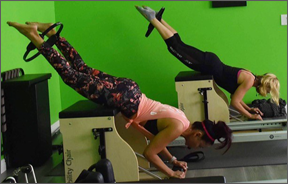 The Stability Chair is a multi-functional Pilates machine that can be adjusted to train all muscle groups to achieve upper- and lower-body strength and conditioning, enhance stability, improve body control and rebalance your muscles while providing a full-body workout. Get the strength training of TRX, the stretching & flexibility of Pilates and the core strengthening of both! Develop strength, balance, flexibility, and core stability with strength training, cardio and resistance drills that burn fat and improve endurance. Take your core to the next level and strengthen your entire body! 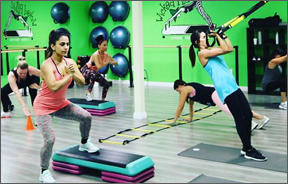 Our Pilates Stability Chair/TRX fusion class challenges your balance, coordination and core strength while working up a sweat! 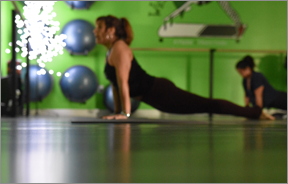 Pilates Mat classes will challenge your strength, flexibility and coordination with traditional and modern Pilates moves performed on the floor or standing. The Pilates method spans all ages and fitness levels and will leave you recharged, with better core awareness and a sleek, toned body. Props such as the Bosu balls, foam rollers and bands may be utilized in class. Yin yoga is a slow-paced style of yoga with poses that are held for longer periods of time. These poses apply moderate stress to the deep connective tissues—the tendons, fascia, and ligaments—to strengthen the body, improve circulation in the joints, and increase flexibility. Vinyasa Yoga is a dynamic system of asanas (poses) that flow in a sequence with each pose complementing those that precede and follow. Focusing on the synchronization of breath & the continuous flow of movement. Vinyasa is a strong form of Yoga that builds heat, endurance, flexibility, strength and mental focus. This class can be strenuous, but is appropriate for all ages and fitness levels. Ditch the Workout and join the PARTY! 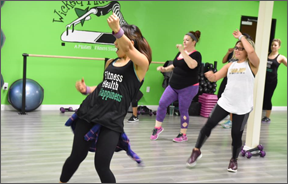 Zumba fuses hypnotic Latin rhythms and easy to follow moves to create a one of a kind fitness program that will torch calories and send your energy levels soaring! Work your legs, glutes, arms, core, and most important - your heart! Time to bring the weights to the PARTY! Zumba Toning combines targeted body-sculpting exercises and high-energy cardio work. 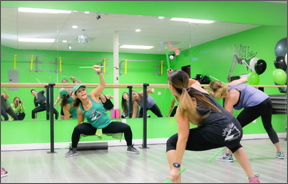 Students learn how to use lightweight, maraca-like Toning Sticks, to enhance rhythm and tone all their target zones, including arms, abs, glutes and thighs. 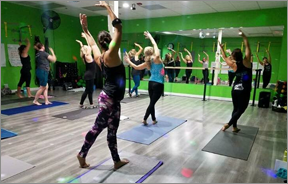 bootybarre is a fun, energetic, workout that fuses techniques from Dance, Pilates, and Yoga that will tone, define and chisel the whole body. It is the perfect combination of strength and flexibility with added cardio to firm, tighten and tone your entire body without adding bulk. Who says you have to jump, grunt, strain, and punish your body to get amazing results from your workout? Not with Piyo... Piyo combines the muscle-sculpting, core-firming benefits of Pilates with the strength and flexibility advantages of yoga. And, we crank up the speed to deliver a true fat-burning, low-impact workout that leaves your body looking long, lean, and incredibly defined. Come ready for ANYTHING! One day could be 'boot camp' style cardio, the next might see you jumping rope on the patio! This will get you burning calories fast! Athletic training shoes are required for this class. A full-body cardio jam session, combining light resistance with constant simulated drumming with lightly weighted drumsticks. The workout fuses cardio, Pilates, isometric movements, plyometrics and isometric poses. 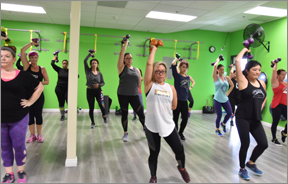 Burn between 400 and 900+ calories per hour, strengthen and sculpt infrequently used muscles and drum your way to a leaner, slimmer physique - all while rocking out to your favorite music! 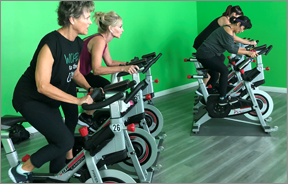 Indoor cycling is a group fitness format. Classes focus on endurance, strength, interval, and high intensity training using the stationary bike. A lot of cardio and fun guaranteed!